This page is to collect all of the trivial information that I am obsessing over regarding using a Prius as a mini-RV, and my husband’s tolerance of the situation. Here’s a quick summary of our story: Our Honda Civic died. My husband has wanted a Prius for forever so this was his chance. We purchased a used 2011 Prius for $16,000. I just happen to be obsessed with tiny houses and tiny campers, so when I read that people use the car as the camper? Be still my heart! First Trip: I forgot the pillows. Fourth ‘trip’: Camping in the backyard with the Habitent. My goal is to have a nice camping experience with the absolute minimum of fuss, expense and stuff. 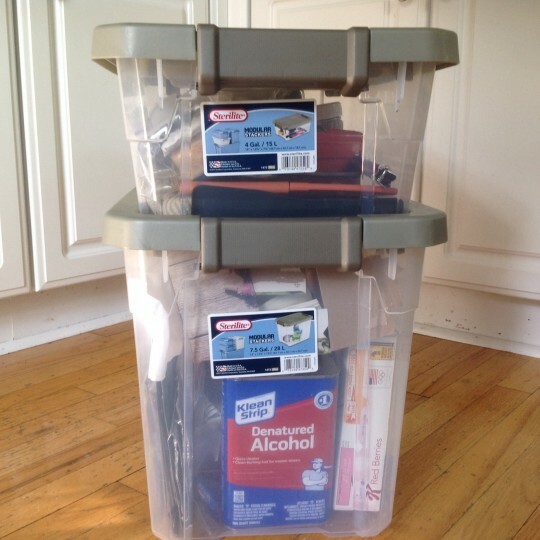 So far we have mostly reused items that we already own, but I have purchased some cooking items, two storage tubs and a cooler. Everything else is something we’ve already had on hand. The pieces are wrapped in cloth. The twin-sized piece has two fitted sheets around it (top and bottom). The photo shows the left side too high – it was before we got the cooler set-up going. UPDATE: I made a fitted mattress from a 3-inch foam topper. Click here for the story. One Coleman 28 quart cooler with cupholdes in the lid – nice! One ‘cooler lifter/stuff sorter’ cobbled together from 1×6 pieces of lumber. Oh, the evenings I would sneak out with a tape measure and try to figure out if we had already anything that would work to make things the right height. I’m still working on the tubs. They have depressions in the lids so when they are stacked they are lower than expected. I’ve made up for the height difference with a folded quilt. 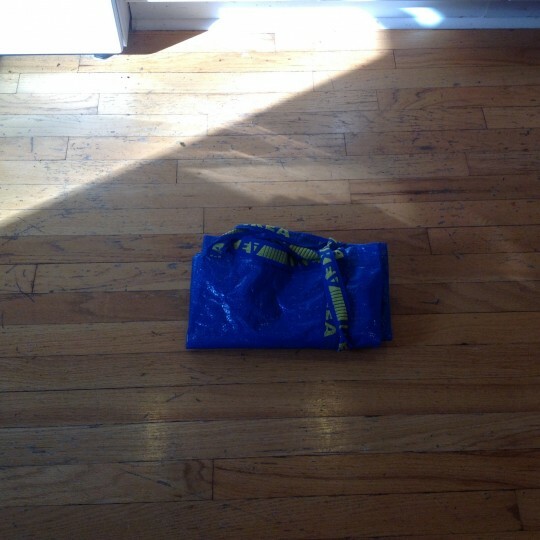 My thought is to make something that sits on the floor to hold them up the right amount. The cooler sits on a rack I made out of pieces of lumber already on hand. 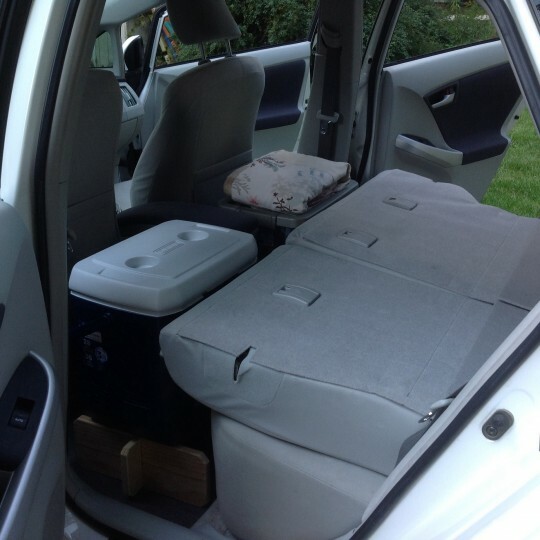 It works well, can stay in the car when we are using the other things, and if you have some small things that you don’t want crushed (like a bag of donuts), it can hang out there. *mistake* When I was working on making it I was not careful and when I was working on checking the fit in the car, I sliced the upholstery with a sharp corner. Stupid me. Good thing it’s a used car. 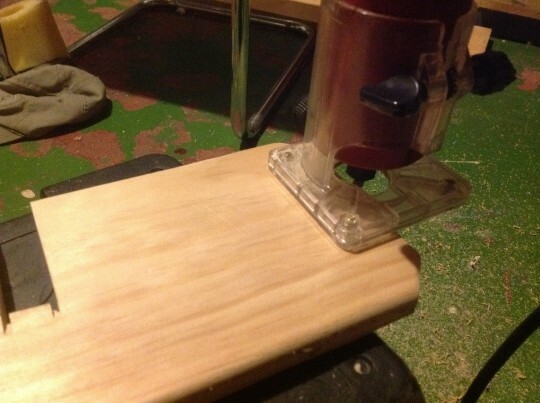 (Link to story) I have since rounded off the corners and routed around all the edges. Here are the seats down. You can see that we’re not quite level, but it doesn’t really matter. Ventilation: Yes, there are condensation issues. 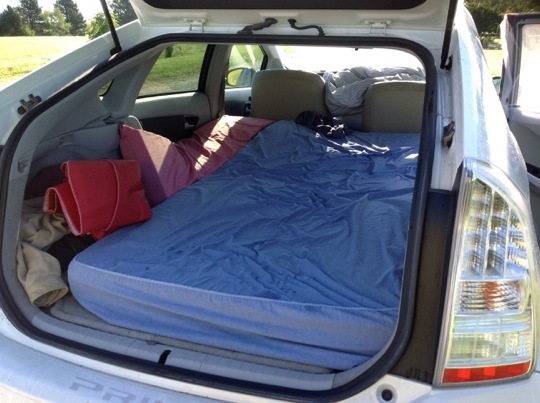 In fact, it’s the thing that makes me want to try sleeping with the car on, except that seems so wasteful. Here’s a breakdown. I should mention that we have camped in the same spot each time – a nearby lake about 20 minutes from home. First trip: Humidity was quite high anyway, and we are sleeping by a lake. We had two windows cracked a couple of inches with the screens up. All the windows were wet. We left the windows open while we ate breakfast and putzed around, and then left the windows open once we got home to air it out. We were fine. Second trip: VERY COLD!! 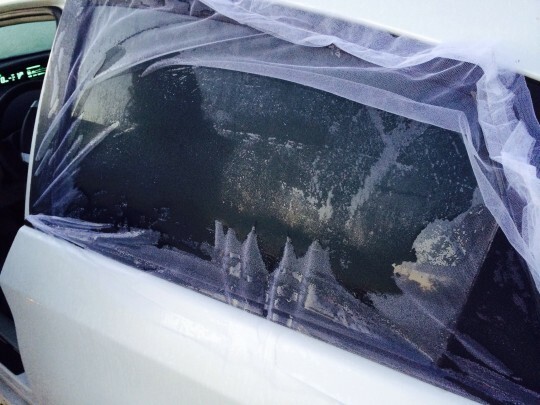 It got into the 30s, we had the windows open about 3 inches and when we got up the inside of the car was very wet. It was foggy outside and so cold we wiped down the inside of the car and just left. We aired out the car later in the day and it seemed to be fine. 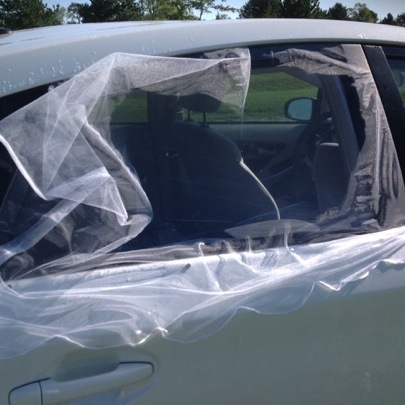 The window screens are made from mesh (my old wedding veil, actually) and are sewn like a pocket. They slip over the top of the door and are held tight to the door by magnets lined up along the bottom. They were made hastily, but I have since sewn them so they are more fitted to the door. This is an improvement over just using magnets to hold a piece of mesh on, because this way you can open and close the door without dislodging it. 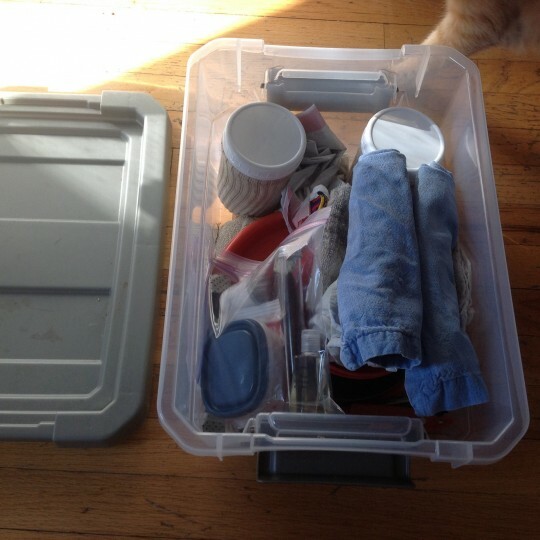 Interior Storage: This is just about what we bring along. 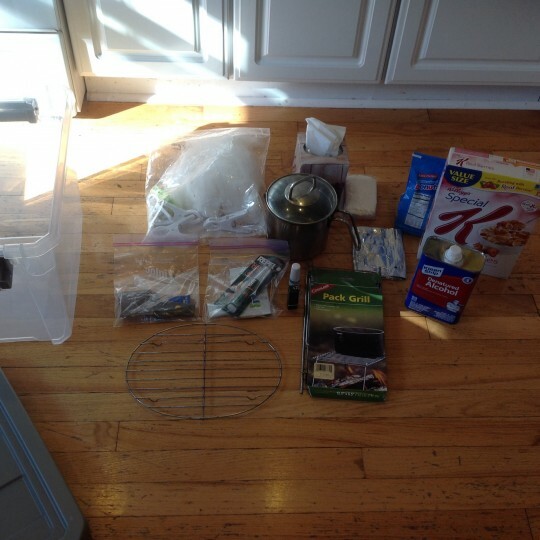 Since we are only camping overnight and close to home, we don’t have a lot of extra stuff. We sleep in our clothes and wear them the next day. 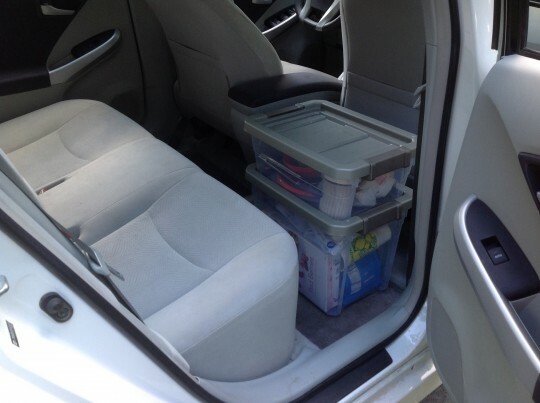 Jackets and shoes are just thrown in the front seat area or wedged in around the cooler and tubs. We take along folding chairs but those stay outside by the camp site, covered in garbage bags so they’re not wet from dew the next morning. 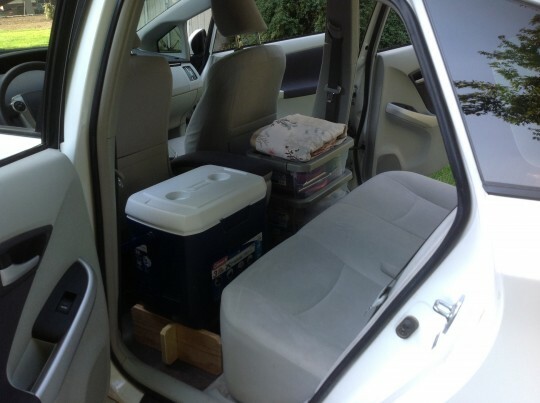 The water container stays out, too, but everything else is in the car. We put our eyeglasses in the little hollow in the car door, phones in the front cupholder and keep a flashlight handy. Lock the doors and goodnight. Privacy Before we went I had rigged up a privacy curtain system, but it turns out we just don’t care. The windows are tinted, and we are, after all, in a campground. If someone wants to watch me drool, go right ahead. The pot to boil water is too tall, so it’s in the other tup. We also are usually drinking from 32-ounces cups (re-used) while we travel, so we have those along, but not stored. Fire We have bought firewood and also have had a friend give us some. 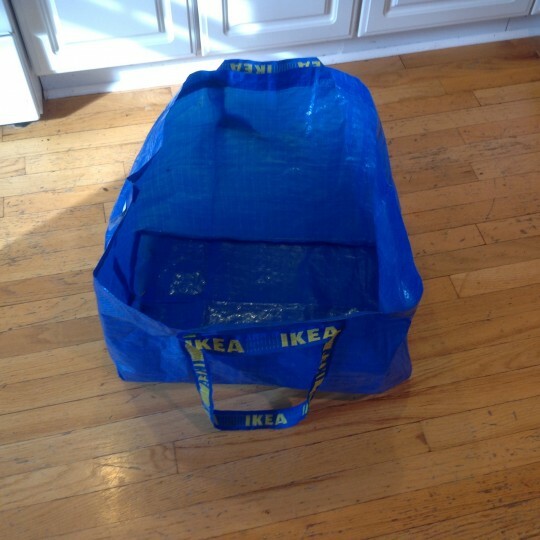 We use a giant IKEA bag to hold it on the way in. (Be careful not to cut the upholstery. Ha ha.) At night we wrap the unused firewood in a garbage bag or the IKEA bag so it will stay dry until morning. The bag is wonderfully durable and folds up to nothing. We don’t take a lot of extra stuff. 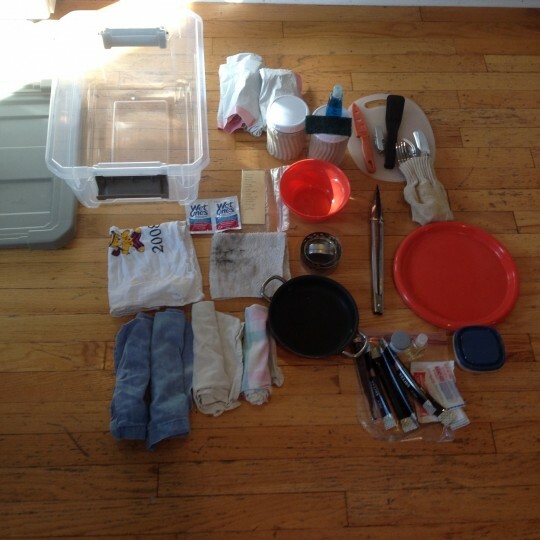 We plan for simple meals and bring just what we need. It’s just dinner and breakfast. Clothing These are reminders just for me. I need to remember to always wear wool socks and bring an extra pair. The first time I wore some Skecher mary-jane style shoes like an idiot. The grass was so wet with dew in the morning my feet were soaked, but at least my wool-sock-clad feet were warmish. When I wore tennis shoes they were also a little damp. Bring enough layers so you’ll be warm during the coldest part of the night. The temperature by the lake is cooler (in the fall) than the rest of the world. 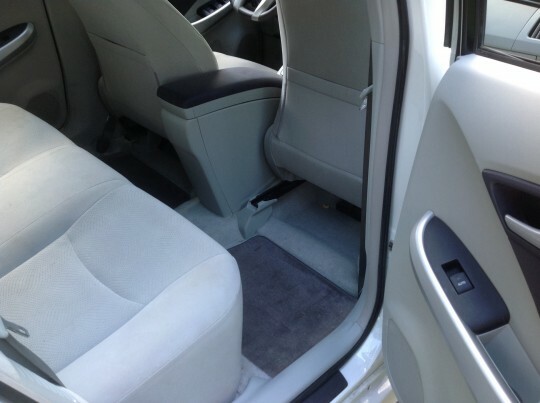 We have a 2011 Prius, and yes -- there is plenty of leg room! I have camped in any number of rented Prius. I always leave the car on through the night. Yes, it’s q bit wasteful but it is so nice to rest in the climate control and the Prius is efficient enough that it doesn’t seem very wasteful. OMG, I am so glad I found your posts. I am just like you! 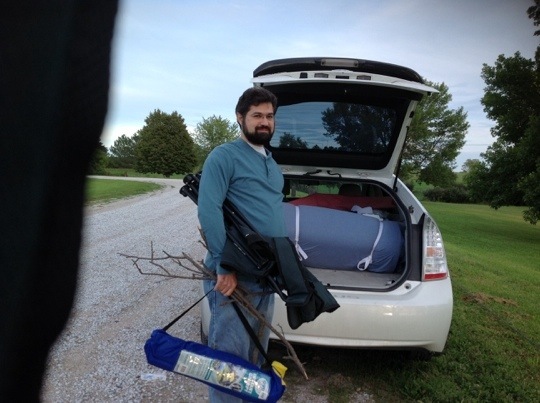 I am doing the same thing with my 2016 prius ( making it into an RV) search for “Brent Prius” on youtube he had quite an elaborate setup with cooking, water etc. He is an engineer apparently. 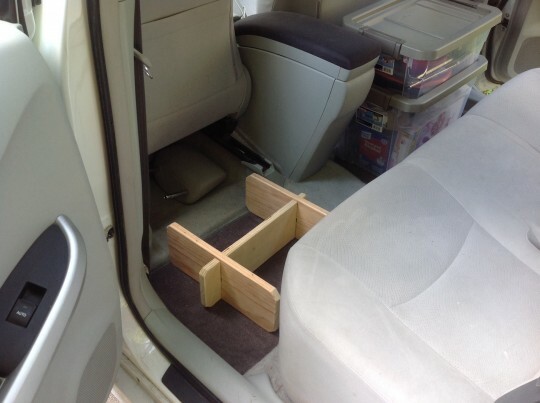 I made a table that fits in the open door of the prius as well based off his video. Love your website! thanks for posting and happy camping. Thanks, Ken! Good to hear from you! 🙂 If you don’t have a Habitent, I highly recommend one. I haven’t linked to it in this post, but if you search for it here you can see it in use. It’s a great thing. I bought a pair of “window socks” for $14 from Amazon, which just slip on, create amazing screen window as well as keep out the sun and act as curtains. I’m getting another pair for the front. For filling the space between front and rear seats you can buy a platform meant for dogs in the car, so they wouldn’t fall off into floor, to make a great bridge. What height have you settled on and what things are you using to accomplish that now?